In recent years, the practice of trading captive propagated fragments of corals has resulted in the concurrent transfer of pest species. Many years ago, the transfer of pest species was notable with the spread of the nuisance anemones, Aiptasia spp. To date there is still no easy method of completely eradicating these rapidly proliferating anemones once they are established in an aquarium, and they are now found as unwanted hitchhikers from populations established in wholesale, retail and hobbyist aquariums around the world. A range of biological, manual and chemical means are used alone or in combination in attempts to control these anemones, usually unsuccessfully. Several years later, similar aquarium outbreaks began occurring with another pest anemone tentatively identified as Anemonia majano. Other nuisance species, including algae, flatworms (e.g., Convolutriloba sp. 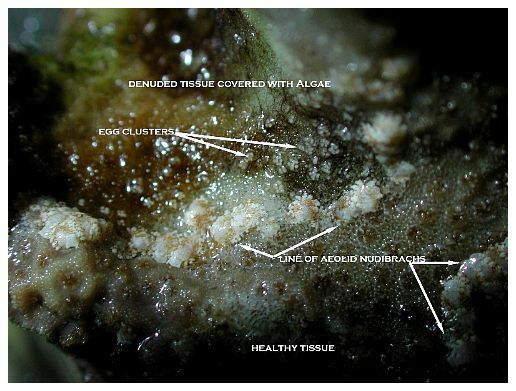 ), cyanobacteria and hydroids, also become problematic for many aquarists by their rapid spread, blooms and difficulty controlling proliferation, to the detriment of other desirable species in the aquarium. Many of these common species, however, are normally present in the aquarium, and transfer may be less important in transient or chronic population increases. There have been occurrences of coral predators and parasites reported as “hitchhikers” on wild-collected corals and live rock for as long as the trade for the reef aquarium hobby has existed. Recent years, however, have seen the introduction of several pest species that are difficult to eradicate and are easily and unintentionally transferred between aquariums through the increasingly common practice of selling or trading captive-grown coral fragments and colonies. It is not known exactly when the initial introduction of these pests occurred, or if there are regular inputs into the trade through continued collections. One of the more common events that has become a mainstay of many local aquarium clubs are “frag swaps,” where club members, often numbering in the hundreds, get together and exchange corals and other livestock. All too often, little to no effort is made to carefully inspect or quarantine livestock acquired at these events. In addition, many retail stores have begun buying fragments of captive-raised corals to resell, and hobbyists have begun selling fragments of corals on eBay and other websites. With so many opportunities for parasites, predators and pathogens tobe spread rapidly, it is little wonder that these pest species have become so widespread, and some are even spread internationally. The aquarium epizootic of parasitic copepods (Tegastes acroporanus) specific to Acropora spp. has become a global concern. While parasitized corals can exist without obvious detriment for many years, high populations of these copepods on some corals causes a bleaching response and can result in mortality (Borneman 2004). Effective treatments are available for this pest, although none are commercially available (Dorton 2004, Borneman 2004). Other coral pests, however, are corallivorous, difficult to eradicate and almost invariably result in total colony mortality. Among the most notable and now widespread of the pests that cause coral mortality are the aeolid nudibranchs that prey on Montipora species. To my knowledge, they are undescribed and, although there are hobbyist reports of them preying on Porites and Anacropora, some taxonomic questions may remain as to the proper identification of the other coral genera because some species of these different genera can resemble each other. Perhaps more than one species of aeolid nudibranch is involved, as well. These nudibranchs have also been stated to sequester the nematocysts of their prey in their cerataby various individuals on numerous websites, although this has not been confirmed to my knowledge, and close examination seems to indicate that they store zooxanthellae from their prey instead (Figure 1). The nudibranchs are hermaphroditic and produce clusters of 3-20 or more eggs that are deposited at or near the boundary between living tissue and the denuded skeleton (Figure 2). Eggs are not produced in spirals or ribbons, but rather in bunches, often separated or even inside corallites (Figures 3, 4). Development and hatching time has not been determined, but they are direct developers and lack a pelagic larval period. 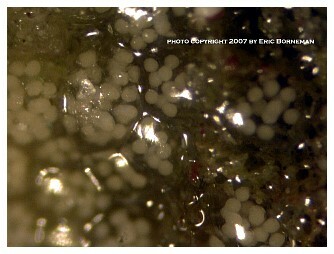 Juveniles hatch from the eggs at less than 0.25mm and grow quickly to a maximum of about 3mm. Their size appears to average 1-2mm, although they grow larger on some species of Montipora than others, and they show species feeding preferences, although all Montipora seem to be potential prey items. The time from hatching until reproductive maturity is not known, nor is their average lifespan or the length of time they can survive without a host. Natural predators are unknown, although anecdotal reports allege that various wrasses, shrimps and pipefishes can control them. None of these, however, has proven to be a consistently efficient predator to my knowledge, and most predators only control prey populations, and do not eradicate them. In fact, little information is known about these populations, though many internet discussions have occurred over the years and a few short articles have been attempted (Whitby 2007). Predation of host Montipora is cooperative. In large numbers, nudibranchs group together and consume the coral in a line, leaving a band-like pattern (Figure 5). Solitary or a few nudibranchs on a coral tend to consume coral tissue, leaving circular to semicircular patches (Figures 6,7). The aeolids are small enough to easily hide and lay eggs in natural fissures and folds of the coral skeleton. 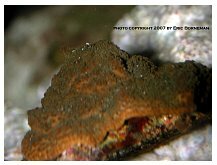 Such crypsis is not required, however, and active predation can and does occur on exposed coral surfaces lacking such microhabitat protection. The cryptic behavior is notable because of the difficulty it presents in observation and eradication of these coral predators. Treatments that hobbyists have tried include freshwater dips, Lugol’s iodine, Tetra Marin Oomed and various commercial coral dips. All have been found to have either a limited effect on adults or their eggs, or to be stressful to corals. Manual removal or blasting using a strong seawater flow or syringe is effective for visible adults, but is time intensive, ineffective against eggs and almost invariably misses adults hidden in the skeleton’s recesses. Two drugs have been useful in pilot trials by aquarists, but are unapproved for use with corals. The first, levamisole, is an antihelmintic and antibiotic compound widely used against many internal helminths helminths in veterinary medicine. It acts as a cholinergic agonist leading to neuromuscular paralysis, is readily soluble in water and has generally low toxicity. It does cause paralysis of the nudibranchs and allows them to be more easily flushed from the coral's surface. No dosage level has been established, however, that kills the nudibranchs but does not kill the coral. Furthermore, levamisole does not appear to have any effect on the nudibranchs' eggs. The second drug used in casual trials is praziquantel, a prescription drug thought to affect calcium channels and also cause paralysis and possibly disrupt oviposition (egg-laying) in sensitive parasites. It is generally used as an antihelmintic against flatworms. It has effects similar to levamisole in the pest nudibranchs, and little data are available to support its effectiveness to date. In September 2005, during emergency preparations for Hurricane Rita, I accepted numerous corals from local club members who were evacuating Houston. As a highly unusual exception given the storm, I did not quarantine the members’ corals before putting them into my culture systems. As a result, I had an outbreak of tegastid copepods on my Acropora species, and aeolid nudibranchs on my Montipora species. I easily eliminated the tegastids by using milbemycin oxime (Interceptor™, Novartis). My attempts to eradicate the nudibranchs, however, took almost a year and included all of the methods listed above except for freshwater dips. In the end, only highly aggressive fragmentation with quarantine and careful observation saved the genotypes I had in culture, and the nudibranchs consumed several hundred fragments of at least eight different species of Montipora. Upon reintroduction to the culture system, the various fragments grew rapidly and showed no evidence of nudibranchs for five months. In May, 2007, however, I noticed a few fragments with white patches of denuded skeleton and found them to have reacquired the predatory nudibranchs. Several fragments had dozens of nudibranchs present and others had none. I began to look at alternative solutions because it appeared that the nudibranchs could survive for extended periods with few or no prey items. A molluscicide is a compound that kills molluscs, of which nudibranchs are an unshelled type. Most of the agents I found that are used in terrestrial studies and practice would be toxic to either the aquarium or the coral. Copper and aluminum compounds are the most used. However, I initially found that potassium permanganate is used to kill the adults and eggs of freshwater snails in aquariums (Andrews 1988), and that garlic has been found to be a repellant and molluscidal agent in terrestrial snails (Singh and Singh 2003), to be effective against mites and nematodes (Moore and Lenglet 2004) and to exhibit antifungal, antiviral and antimicrobial properties (Singh, et al 1998; Shadkchan, et al 2004, and see supplemental references). I hesitated and was skeptical of the garlic claim because garlic has become an anecdotal panacea for many marine aquarium maladies, with little scientific evidence of its effectiveness (Pro 2005). I had used potassium permanganate in reef aquariums without apparent detriment many years ago in the form of an organic oxidant product called Poly-Ox (Kent Marine) that was, at the time, advertised as reef-safe if used as directed. The product is still made. Because this new outbreak of aeolids was small, and because the number of Montipora fragments in my culture systems had been dramatically reduced, I was unable to carry out the degree of replicates and dosage schedules that would have been ideal. However, the success of some of the methods has given me enough confidence to believe that these treatments should be used by others, and hopefully in a controlled manner, so that appropriate and effective dose responses can be obtained. I reluctantly and skeptically engaged a number of trials using fresh garlic and garlic products. Narrative descriptions of these trials follow below. Nudibranchs immediately crawl away from egg laying areas and tissue margins. They do not react the same as with fresh garlic, but their escape-like response to a noxious agent is apparent. All nudibranchs still moving normally but moving away from coral tissue or across the coral’s surface. Nudibranchs removed from MS1 curl up but remain very responsive to probing, though they do not crawl. Corals appear unaffected. Only one nudibranch still visible on coral MS2, and still crawling. Most others are motionless and the remainder are barely responsive. All nudibranchs motionless and appear dead; removed and placed into 95% ethanol for identification. 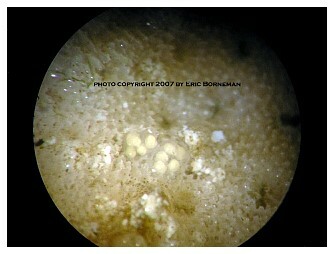 Eggs still attached to coral and will be monitored. Reaction of corals when replaced into water: they are not releasing large amounts of mucus and seem unaffected by the treatment, in contrast to the fresh garlic. nudibranchs appear nearly dead, some are disintegrating; water appears brownish. Multiple fragments of four species (three MS1, two MS2, two MS3 and three each of M. digitata; green, purple and pink morphs) were exposed to 200mg KMnO4 dissolved in 1000ml aquarium water. Some colonies had nudibranchs present with egg masses; some had neither visible egg masses nor nudibranchs. Colonies remained in the solution for two hours, were rinsed in seawater and removed. All nudibranchs and egg masses were gone, presumably disintegrated. The treatment water was opaque purple brown, indicating an excess of KMnO4 for the amount of organic material oxidized over the two-hour time frame. The corals appeared dead; no mucus was palpable and the polyps appeared disintegrated. They appeared to have only bare skeleton with no overlying tissue. The coral colonies were placed into the quarantine system (sharing same water volume as original colonies). 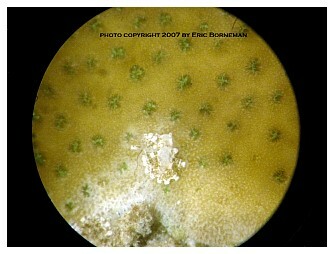 After two days, four M. digitata colonies began extending polyps. After four days, two MS1 colonies, two MS2 colonies, two MS3 colonies and five M. digitata colonies all extended their polyps and appeared normal and healthy, except for areas devoid of tissue previously consumed by nudibranchs. Total mortality from treatment was four M. digitata fragments and one MS1 fragment. This treatment dosage was very stressful to the colonies but indicates an upper concentration limit and time for what was almost an LD50 level (LD31.50) for corals, and effected a 100% kill rate for nudibranchs and egg masses. Fragments of the same number and genets used in Trial 3, but all hosting aeolid nudibranchs and egg masses, were exposed to 50mg KMnO4 dissolved in 1000ml aquarium water for 1.5-3.5 hours. In no case were nudibranchs or eggs visible on any corals after the treatment durations. Corals in the 3.5 hour treatment looked highly stressed and appeared grossly like those exposed to the 200mg/l dose of Trial 2. They recovered much more quickly, however, and all appeared normal within 24 hours. No coral mortalities occurred. Fragments of the same number and genets used in Trial 3, but all hosting aeolid nudibranchs and egg masses, were exposed to 50mg KMnO4 dissolved in 1000ml aquarium water for 1.5 hours. In no case were nudibranchs or eggs visible on any corals after the treatment durations. Corals appeared normal after 24 hours. Several natural molluscicides are available for use against non-marine snails, including seeds, extracts and oils of Azadirachta indica (neem), Cedrus deodara (cedar), Allium sativum (garlic), Polianthes tuberosa (tuberosebulb), Zingiber officinale (ginger), Lawsonia inermis (henna), Annona squamosa (custard apple), Sapindus trifoliatus (soap nut), Acacia concinna (shikakai), Madhuca indica (mowra, honey tree), Phytolacca acinosa (pokeweed) or combinations with other plant-derived molluscicides that are very effective against both adult snails and their reproduction. These have been reviewed in numerous papers (Singh and Singh 2003, 2004; Rao and Singh 2002; Sukamaran et al 2002). Many of these, and most non-natural and novel molluscicidals (Schüder et al 2004), clearly cannot be used against corallivorous snails because they contain copper, other metals or other compounds that are highly toxic to corals and other invertebrates. Others contain compounds that various aquatic ecotoxicity studies have proven to be harmful to aquatic life; though few, if any, have been tested on corals. Among those with the lowest toxicity, in general, are some of the biologically active compounds of natural products. The effectiveness of any biocidal agent is determined by the number of target species it kills. Ideal biocidal agents kill or harm only the target species, and not the non-target (host, desirable) species. An example of a nearly ideal biocide is the use of various flea drugs (e.g., Advantage™, Program™, Revolution™, etc.) that act specifically against characteristics of the target species that are not present in the non-target species. In almost all situations, however, some cases exist where side-effects or unplanned undesirable effects occur, even if minimal. In other cases, such as some cancers, drug therapy is based on agents that kill all cells but preferentially kill target over non-target cells. In these cases, harm or death is a distinct possibility in even the non-target species, but treatment benefits outweigh the risks of no treatment. Corals are essentially completely unstudied in the use of any treatments for any diseases, pests, pathogens or parasites. This is unlikely to change because treating coral colonies in the field is impractical. Therefore, knowledge and trials of various therapies for infected, infested or otherwise ailing corals will likely be pioneered by those maintaining corals in captivity where trials can be conducted. The discovery of Interceptor™ (Novartis, Inc.) as a therapeutic agent for parasitic copepods was truly remarkable because it represented a nearly idealized coral therapy that targeted a parasite, and not the host (Dorton 2004). If used in an aquarium, however, it does target many other non-coral species such as crustaceans and polychaetes (Borneman 2004). Ideally, such a therapy would be found for all coral issues, but it is unlikely that therapies will always be ideal, and rather will likely fall along a continuum of variable effectiveness against target and non-target species, such as the examples illustrated above. Generally, it is ideal to perform an LD50 or LC50 test, which determines the amount (dose/concentration) of a compound needed to kill 50% of the subject population tested. This gives an idea of the compound's toxicity against the species. An ideal treatment has a very high LD50 or LC50 for a host or non-target species (e.g., the coral), and a low LD50 or LC50 for the target (e.g., the nudibranchs). Of course, any kind of rigorous therapy, treatment and experimentation require many test organisms, dosages and variations. This is impractical for aquarists, and very costly and time-intensive. When dealing with situations such as outbreaks of Tegastes copepods, Montipora nudibranchs or Acropora flatworms, the density of pest species may be high enough to get some quantitative data, and an aquarist or researcher could potentially create enough fragments to perform some sort of quantitative work on the corals. To have enough infested/infected corals to perform trials on the combination of target/non-target species is much more difficult in terms of the numbers required, and this does not include controls. Therefore, any suggested “treatments” for coral maladies are likely to include some significant gaps in the data. Likewise, this work has gaps. 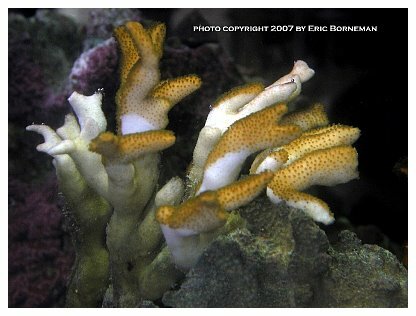 When I first had an outbreak of Montipora nudibranchs, my immediate and logical thought pattern was to save as many corals as I could by whatever means possible. The lack of a carefully defined or known effective protocol caused me to lose virtually all the corals I was attempting to save. When this second smaller outbreak occurred, I had limited material available and the loss of a few fragments was less of a concern to me, and so I attempted to incorporate some degree of control and thought into my experimental trials. 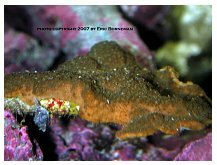 I have not yet found a “cure” or a defined protocol; however, I have found two compounds that seem to hold potential for use in eradicating the aeolid nudibranchs that prey on Montipora. To determine how effective they are will require further work by others, more trials and longer term monitoring. I would include myself in that group to perform additional trials, but I am sincerely hoping to have eliminated these pests for good, and will not try to build on my current work because of the time and funding required to obtain more nudibranchs and grow more coral fragments. Perhaps other treatments will be found, but today the primary issue seems to be finding an agent or combination of agents that can kill the chemically resistant egg masses. I believe that at least one of these, notably, the potassium permanganate, is effective. When I read that garlic had been found to be an effective gastropod repellent and molluscide, I cringed (Singh and Singh 1999). Over the years, garlic has been touted as a virtual panacea for marine ornamentals and is available in foods, supplements and commercial treatments, with little credible evidence (Pro 2005). I truly did not want to write an article stating that garlic is a cure for Montipora nudibranchs but, as it turns out, garlic can be effective. Fresh garlic, without question, kills juvenile and adult nudibranchs. I have not been able to accurately determine its effect on egg masses, although no egg masses have successfully hatched on treated corals to date. Part of the reason for the loss of egg masses is that fresh garlic also killed corals at the dose I used. I also treated corals in stagnant water, and I have lost Montipora fragments to a gel-like slime simply by keeping them in small volumes of stagnant aquarium water for the durations used in the treatments. Perhaps fresh garlic in circulating seawater would have killed the nudibranchs, but not the corals. Perhaps the amount of fresh garlic used was too great, and a smaller amount used for longer durations, or a larger amount for shorter durations, would have been more effective. This should be investigated. Allicin is the toxic agent known to act as the molluscicide in garlic (Singh and Singh 1999). Allicin is not present until the enzyme alliinase activates the precursor, alliin, and this occurs when fresh garlic is cut or crushed. When I used aged garlic or garlic oil, in which allicin was not present or available in the water, there was no molluscidal activity; the corals and nudibranchs survived the treatment. A commercial tablet with active allicin, Pur-Gar™, did kill nudibranchs. It did not produce as acute an initial response by the nudibranchs as fresh garlic, as shown by observing their behavior, but it killed the nudibranchs in a similar time frame and did not kill the corals. This product, once hydrated in seawater, also appeared to be like dehydrated garlic, rather than dissolving in water or leaving a residue. The equivalent dose, according to the package, was equivalent to ½ of a fresh garlic clove. I used a full fresh garlic clove in the trials that killed corals. Several issues exist with these comparative doses, however. First, not all garlic cloves are the same size. Second, not all garlic has the same levels of alliin or, therefore, allicin. Third, of the few commercial preparations of garlic supplements that contain active allicin, the manufacturers vary substantially in their statements of the amount of allicin in their products and their stated equivalence to fresh garlic. A final comment on the effectiveness of garlic/allicin is notable with regard to the claims of other aquarium products containing garlic. Most garlic supplements, additives and products do not contain a form of garlic that contains active allicin. Just because a product contains “garlic” does not mean that its activity is related to that of fresh garlic (Berges, et al 2004), or an active allicin preparation (Pur-Gar™, Allisure™, etc. ), by example. Potassium permanganate is a strong oxidant with diverse uses, from explosives to water treatment. It can remove iron, sterilize water and disinfect crops, and is used to treat parasites and bacterial/fungal infections of fish in aquaculture. It is also used in dilute solutions of 10mg/ml to remove freshwater snails and eggs from freshwater planted aquariums by dipping the plants into the solution for 10 minutes (Andrews, et al 1988). It reacts with any organic matter including algae, bacteria, fish, particulate and dissolved organics, and organic bottom sediments (note: it is quite effective at killing algae on rocks (Todd, pers. comm.)). It is not a material to be used without caution. High quality potassium permanganate is available commercially at chemistry, pool and water treatment purification sources. I used different strengths, most of which were stronger than those used to dip freshwater plants, because I did not see a strong enough initial reaction from nudibranchs placed into the freshwater concentration. It could very well be that lower dosages are effective and safer to use than the stronger concentrations and longer durations I used. More work would be required to determine if lower concentrations would be effective, but I did not have enough coral fragments or nudibranchs available to expand the scope of the trials. I have used dosage levels from 5-20 times higher than the freshwater snail dip concentration for durations 9-21 times longer. Only at the 200mg/l concentration for 120 minutes did some coral fragments not recover. In fact, five of the 16 fragments did not live, establishing a "pseudo"-LD50 for Montipora in potassium permanganate. This is a very flimsy LD50, composed of only 16 fragments, not all of which are even the same species of Montipora. Still, it is a start. I have asked several other aquarists to confirm and/or expand the information on coral survival and nudibranch mortality. Some of their findings are communicated below. I have found so far that 50mg/l for 90 minutes is a dosage level that kills 100% of pest aeolid nudibranchs and their egg masses on four species of Montipora. I believe that this is probably a very stressful dose level despite 100% survival of treated corals (n=49). I believe that a lower concentration or a shorter duration is probably still effective, but I do not have enough nudibranchs or coral fragments to expand the scope of the trials. I urge others to help provide more data about this treatment. 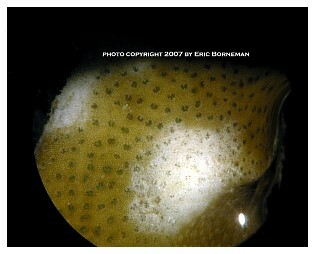 Photos of corals directly after treatment and 24 hours later are shown (Figures 8-10). 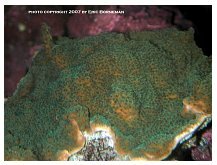 A local aquarist found his colonies of Montipora to be colonized by pest aeolid nudibranchs (Todd, pers. comm.). He also found them on the walls of the aquarium and on the egg crate in his fragment tanks. Surprisingly, he found a nudibranch near a lesion on an Acropora and believed it to be consuming two specimens of that genus. The identity of the nudibranchs has not yet been confirmed, but they were visually distributed as a typically appearing outbreak population on his Montipora colonies. He decided to isolate Montipora colonies in one tank and then use a volumetric approximation of the 50mg/l dose for a 40-gallon aquarium with sand, corals, fish and other snails present. During the course of treatment, he removed two fish that appeared to be in distress. The removal of the fish caused a small amount of the treated water to be displaced and move into an overflow and into another tank below it (accidental treatment) containing other species of fish and coral. Even this small amount of treated water had surprising effects within a period of about 10 hours at the low concentration of the accidental treatment tank. He reported that all the fish died rapidly. Xenia and Anthelia “melted” and died rapidly. Pocillopora damicornis and Seriatopora hystrix sloughed their tissue. 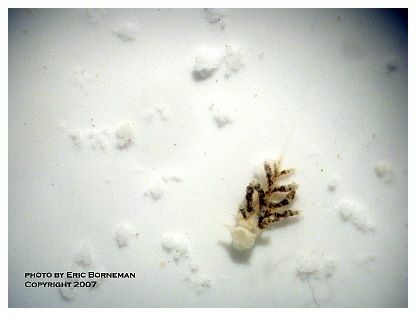 In both the treatment and accidental treatment tanks, errant polychaetes died, but small “feather worm” polychaetes survived. Stomatella snails, a largely unprotected species, survived. Larger and smaller species of Trochus survived, although the larger species were clearly stressed when initially exposed in the treatment tank. Perhaps their operculums effectively kept out the KMnO4 treated water. A Sarcophyton were clearly stressed, but Sinularia were apparently unaffected. All zoanthids, Aiptasia and Psammacora were unaffected. Turbinaria reacted acutely to the first exposure, but then recovered fully as though unaffected. All pest aeolid nudibranchs had disintegrated and all egg masses had vanished. A second aquarist has also used the potassium permanganate treatment. He also noted variable survival of the corals at the 50mg/l dose level but with 100% mortality of nudibranchs and eggs. He noted that some colonies appeared to have egg masses still attached, but that these disintegrated rapidly after the colonies were put back into a quarantine tank. He also found that 30 minutes seemed to be long enough to cause nudibranchs and egg masses to be killed. He stated that it is the only treatment that he has tried that works on the eggs, but also noted it was stressful to the corals. Once again, I reiterate that while potassium permanganate appears to have potential, the ideal treatment concentration and duration requires more trials and individual variance among Montipora species or their general health may affect the final treatment dosage. Clearly, this is not a “reef tank-safe” treatment. It appears to be an effective treatment for Montipora-eating aeolid nudibranchs, and perhaps other pest nudibranchs. At least five species of Montipora (four of my species and additional species in the other aquarists’ aquariums) can tolerate and survive a dose level that kills 100% of nudibranchs and egg masses. I do not think that the ideal dose level has been determined, but I do think that this treatment shows promise for treating Montipora parasitized by pest aeolids. There are also nudibranchs and sundial snails (Heliacus spp.) that prey on zoanthids and, while the effectiveness of the treatment on zoanthid nudibranchs and sundials has not been tested, apparently zoanthids tolerate the potassium permanganate treatment. Other coral species clearly are sensitive and have high mortality when exposed to this chemical, so it is not a treatment for all corals. I urge others to contribute their findings to this body of work. Concentrations, durations, species used and effectiveness should be measured. I cannot stress enough that my trials here are hopeful and, to some degree, successful, but these trials are preliminary and are given here to be used with extreme caution. Do not attempt to treat a reef tank using these methods. All treatments should occur in a treatment tank or container. Before using potassium permanganate, please read the MSDS sheets for potassium permanganate (e.g., http://www.cdc.gov/niosh/ipcsneng/neng0672.html), because it can be a lethal compound if ingested, and this is a heretofore unmentioned use of this product. If a better compound is found or a better protocol is found using allicin or potassium permanganate, it should be documented, repeated and recorded. If there are any questions, comments or contributions from others who use the methods described herein or other methods, please contact me at my e-mail address (eborneman@uh.edu). Andrews, C., A. Exell, N. Carrington. 1988. Manual of Fish Health: Everything You Need to Know About Aquarium Fish, Their Environment and Disease Prevention. Tetra Press. 208pp. Bergès, R., M.-H. Siess, I. Arnault, J. Auger, R. Kahane, M.-F. Pinnert, M.-F. Vernevaut, A.-M. le Bon. 2004. Comparison of chemopreventive efficacies of garlic powders with different alliin contents against aflatoxin B1 carcinogenicity in rats. Carcinogenesis 25: 1953-1959. Borneman, Eric H. 2004. Pathologies affecting reef corals in captivity. Proc 10th Int Coral Reef Symp, Okinawa. Abstract. Moore, S.J., and A.D. Lenglet. 2004. An overview of plants used as insect repellents. In: Insect Repellents: Principles, Methods, and Use. (Debboun, M., Frances, S.P. and Strickman, D., eds.) CRC Press, Taylor & Francis Group Boca Raton Florida. Pp. 343-363. Pro, Steven. 2005. Garlic: what has been studied versus what has been claimed. Reefkeeping Magazine, October 2005. Rao, I.G., and D.K. Singh. 2002. Toxic effect of single and binary treatments of synthetic and plant-derived molluscicides against Achatina fulica. J Appl Toxicol 22: 211- 215. Schüder, I., G. Port, J. Bennison. 2004. The behavioural response of slugs and snails to novel molluscicides, irritants and repellents. Pest Manag Sci 60: 1171-1177. Shadkchan, Y., E. Shemesh, D. Mireelman, T. Miron, A. Rabinkov, M. Wilchek, N. Osherov. 2004. Efficacy of allicin, the reactive molecule of garlic, in inhibitingAspergillus spp. in vitro, and in a murine model of disseminated Aspergillosis. J Antimicrob Chemother 53; 832-836. Singh, A., and D.K. Singh. 2004. Effect of herbal molluscicides and their combinations on the reproduction of the snail Lymnaea acuminata. Arch Env Contam Toxicol 46: 470-477. Singh, A., and D.K. Singh. 2003. Enzyme inhibition by herbal molluscicides in the nervous system of the snail Lymnaea acuminata. J Sci, Isl Rep Iran 14: 227-233. Singh, V.K., D.K. Singh. 1999. Enzyme inhibition by allicin, the molluscicidal agent of Allium sativum L. (Garlic). Phytother Res 10: 383-386. Singh, S., S. Sudhir, S. Agarwal, K. Santosh, S. Verma, M.S. Siddiqui, S. Kumar. 1998. Chemistry of garlic (Allium sativum) with special reference to alliin and allicin: A review. J Med Arom Plant Sci 20: 93-100. Sukumaran, D., B.D. Parashar and K.M. Rao. 2002. Evaluation of some plant molluscicides against a freshwater snail, Lymnaea luteola, the vector of animal schistosomiasis. Pharm Biol 40: 45-455. Whitby, P. 2007. Montipora eating nudibranchs. http://www.mycomas.com. Ankri S., Miron T., Rabinkov A., Wilchek M., Mirelman D. 1997. Allicin from garlic strongly inhibits cysteine proteinases and cytopathic effects of Entamoeba histolytica, Antimicrob. Agents Chemother. 10: 2286-2288. Block E. 1985. The chemistry of garlic and onion, Sc. Am. 252: 94-99. Cavallito C., Bailey J.H. 1944. Allicin, the antibacterial principle of Allium sativum. Isolation, physical properties and antibacterial action, J. Am. Chem. Soc. 66: 1944-1952. Celiini L., Di Campli B., Masulli M., Di Bartolomeo S., Aliocati N. 1996. Inhibition of Helicobacter pylori by garlic extract (Allium sativum), FEMS Immenol. Med. Micrbiol 13: 273-277. Chowdhury A.K., Ahsan M., Islam S.N., Ahmed Z.U. 1991. Efficacy of aqueous extract of garlic and allicin in experimental shigellosis in rabbits, Ind. J. Med. Res. 93: 33-36. Darbyshire B., Henry R.J. 1981. Differences in fructan content and synthesis in some Allium species, New Phytol. 87: 249-256. Davis L.B., Shen 3., Rover R.E. 1994. In vitro synergism of concentrated Allium sativum extract and amphotericin B against Cryptococcus neoformans. Planta Med. 60: 546-549. Ellmore G.S., Feldberg R.S. 1994. Alliin lyase localization in bundle sheaths of garlic clove (Allium sativum), Am. J. Bat. 81: 89-94. Focke M., Feld A., Lichtenthaler K. 1990. Allicin, a naturally occurring antibiotic from garlic, specifically inhibits acetyl-CoA synthetase, FEBS Let. 261: 106-108. Feldberg R.S., Chang S.C., Kotik A.N., Nadler M., Neuwirth Z., Sundstrom D.C., Thompson N.H. 1988. In vitro mechanism of inhibition of bacterial cell growth by allicin, Antimicrob. Agents Chemother. 32: 17631768. Girnenez M.A., Solanes R.E., Girneriez D.F., Growth of Clostridium botulinum in media with garlic, Rev. Argent. Microbioi. 20: 17-24. Gonzalez-Fandos F., Garcia-Lopez Mi., Sierra Mi., Otero A. 1994. Staphylococcal growth and enterotoxins (A-D) and thermonuclease synthesis in the presence of dehydrated garlic, J. Appl. Bacteriol. 77: 549-552. Hughes E.G., Lawson L.D. 1991. Antimicrobial effects of Allium sativum L. (I garlic) Allium ameelopratrum (elephant garlic) and Allium cepa L. (Onion) garlic compounds and commercial garlic supplement products, Phytother. Res. 5: 154-158. Koch H.P., Lawson L.D. 1996. Garlic, the science and therapeutic application of Allium sativum L. and related species, Williams and Wilkins, Baltimore: pp. 1-233. Lawson L.D. 1996. The composition and chemistry of garlic cloves and processed garlic, in: Koch H.P., Lawson L.D. (Eds. ), Garlic: the science and therapeutic application of Allium sativum L., Williams and Wilkins, Baltimore, 1996, pp. 37-108. Mirelman D., Motsheit D., Vaton S. 1987. Inhibition of growth of Enantomoeba histolytica by allicin, the active principle of garlic extract (Allium sativum), J. Infect. Dis. 156: 243-244. Rabinkov A.,. Miron T., Konsrantinovski L., Wilchek M., Mirelman D., Weiner L. 1998. The mode of action of allicin: trapping of radicals and interaction with thiol containing proteins, Biochim. Biophys. Acta 1379: 233-244. Rabinkov A., Wilchek M., Mirelman D. 1995. Alumnae (alum lyase) from garlic (Allium sativum) is glycosylated at ASN146 and forms a complex with a garlic mannosespecific lectin, Glycoconj. 312: 690-698. Rabinkov A., Xiao-Zhu Z., Grafl G., Galili G., Mirelman D. 1994. Alum lyase (alliinase) from garlic (Allium sativum): Biochemical characterization and cDNAcloning, Appl.Biochem.Biotechnol. 48: 149-171. Stall A., Seebeck E. 1951. Chemical investigations of alliin, and the specific principle of garlic, Adv. Enzymol. 11: 377-400. Tsai Y., Cole L.L., Davis L.E., Lockwood S.J., Simmons V., Wild G.C. 1985. Antiviral properties of garlic: in vitro effects on influenza B, herpes simplex and coxsackie viruses, Planta Med. 5: 460-461. Uchida Y., Takahashi T., Sato N. 1975. The characteristics of the antibacterial activity of garlic, Jpn J. Antibiotics 28: 638-642. Urbina J.A., Marchan F., Lazardi K., Visbal G., Apitz-Castro R., Gil F., Aguirre T., Piras M.M., Piras R. 1993. Inhibition of phosphatidylcholine biosynthesis and cell proliferation in Trypanosoma cruzi by ajoene, an antiplatelet compound isolated from garlic, Biochem. Pharmacol. 45: 2381-2387. Van Damme, Smeets K., Torrekens S., Van Leaven F., Peumans W.J. 1992. Isolation and characterization of alliinase cDNA clones from garlic (Allium sativum L.) and related species, Eur. J. Biochem. 209: 751-757. Yamada Y., Azuma K. 1997. Evaluation of the in vitro antifungal activity of allicin, Antimicrob. Agents Chemother. 1: 743-749.